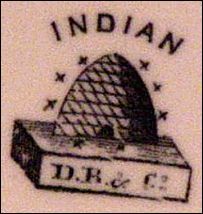 The beehive was a picture of industry and cooperation - this mark appears to have first been used by Samuel Alcock - he moved into the Hill Pottery, Burslem around 1828 and rebuilt it in 1839 - the Hill Pottery was large and impressive. 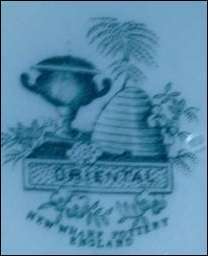 These works were used by many potters and some of them (Dunn Bennett and Burgess & Leigh) carried on with the use of the beehive mark. 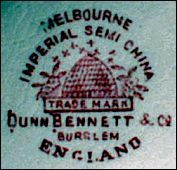 Most marks after 1907 have "& Co Ltd"
Marked "KENSINGTON" which is the pattern name. "B & L & Co" for Burgess Leigh & Co.
Burgess Leigh & Co occupied the Central Pottery, Burslem from 1862 to 1867. 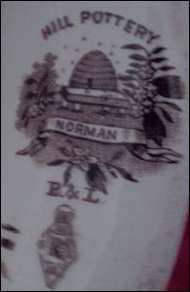 Marked "HILL POTTERY" "NORMAN" which is the pattern name. "B & L" for Burgess and Leigh. In 1867 Burgess & Leigh occupied the earthenware department at the Hill Pottery and then in 1899 moved to purpose built pottery at Middleport. 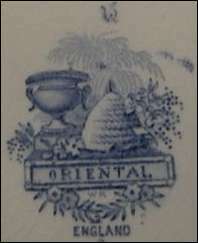 Burgess & Leigh continued to use the beehive mark when they moved to the Middleport pottery. In 1877 Thomas, or T.F. Wood as he was called in later years, along with his brother William Wood, purchased for £5075 a site in Navigation Road, which they called New Wharf Pottery, and which they had probably been tenants or since 1875. The name New Wharf was probably derived from the New Wharf that was built on the nearby canal at that time. 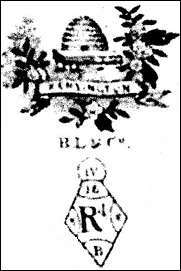 the use of the 'garden urn' as part of a pottery mark was used extensively by the Ridgway families. 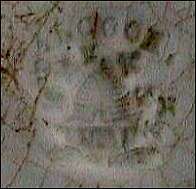 William Ridgway (c.1830's) and their subsequent pottery companies used this style of mark with the garden urn. 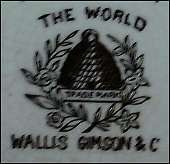 This is an identical designed mark as the New Wharf Pottery mark shown above - there is no known connection between the two companies, however it was not unknown for potters to swap plain ware for redecorating, moulds and patterns - so the New Wharf Pottery may have used some Ridgway ware to get them going at the new works.